The AfriCart (also known as the Malawi Handcart) aims to improve the quality of life and the economic productivity of rural Africans by providing them with affordable and appropriate wheeled transport. AfriCarts offer people time and labor-saving capabilities, which translate into enhanced economic productivity, enhanced domestic food supply and therefore increased income derived from the sale of agricultural surplus. AfriCarts can be made from open source designs and locally available materials. 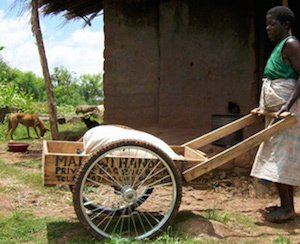 The Malawi Handcart Project was founded by a member of the Peace Corps, who noted the lack of wheeled transportation in Malawi and the negative impact it had on the well-being of residents.